Sri Lanka has a long and remarkable history, most of which has happened in its jungles. We went to see Sri Lanka’s ancient cities that once were the capitals of some of the world’s great kingdoms. Sri Lanka’s ancient cities had dagobas almost as big as the Egyptian pyramids. One after one these cities disappeared and became parts of the jungle – until the Europeans came and found the lost cities. And the dagobas were still there, well preserved. Excavations go on in Sri Lanka’s jungles and more temples, palaces and private homes are found. The area the question is called the Cultural Triangle and it’s located in Central Sri Lanka. Central Sri Lanka is a must see place if you are in the country and a real treasure for history and nature lovers. But what were these ancient cities and why did they all disappear? The first city was Anuradhapura from where the kings ruled the country for more than a thousand years, from the 4th century BC to the 11th century AD. In that phase the kings moved to Polonnaruwa that became the new capital of Sri Lanka. However in the 13th century Sri Lanka was invaded from India and Polonnaruwa was abandoned and forgotten in the jungle. Later on Sri Lanka was ruled from Kandy further south, until the British came in 1815 and the capital was moved to the coast. 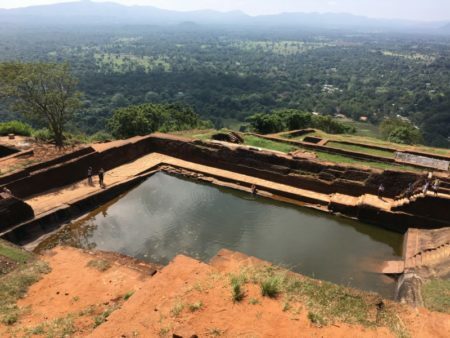 The castle on Sigiriya Rock again was built in the 5th century by a prince who lived on the rock top for a couple of decades until he committed suicide. Monks lived on the rock until it was abandoned in the 12th century and forgotten in the jungle. So all these ancient cities and temples first flourished and then disappeared – and the jungle took over. This is our Sri Lanka driving itinerary that in itself covered more than the ancient cities. To see the ruined cities we first went to Anuradhapura that you can see marked on the map. Then we went to the East Coast which makes a different story. Returning from there we went to Sigiriya that is also marked and Polonnaruwa east of it. What more did we see in the Cultural Triangle? We took an elephant safari to Kaudulla National Park and visited the Dambulla Cave Temples south of Sigiriya. We were touring Sri Lanka for two weeks in all, with a car and a driver which we had for our whole stay. 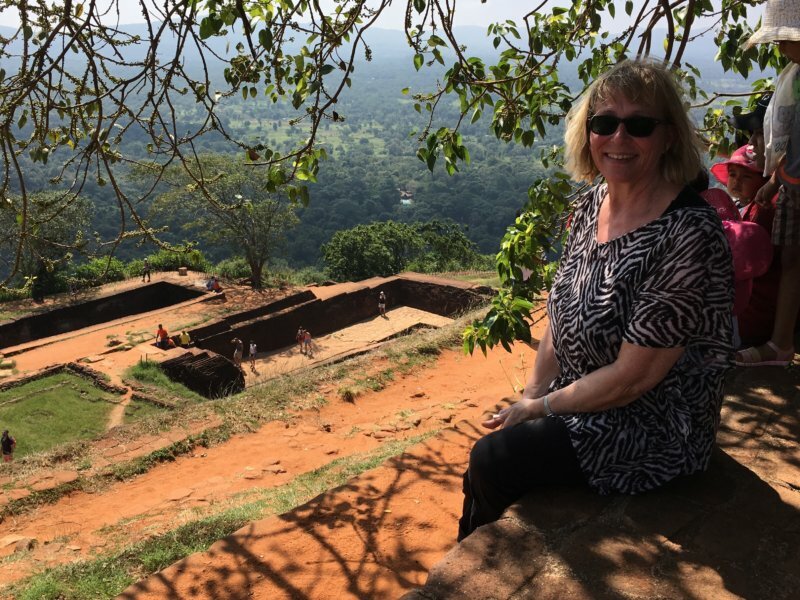 If you want to know how we did that and what travel agent was involved check out my Sri Lanka main post What to See in Sri Lanka. Anuradhapura was a wealthy jungle city and home to 2 million people and the whole island was ruled from here for a long time. There were 113 successive kings that all added their monuments. Anuradhapura contains three large dagobas (stupas): Jetavanarama Dagoba that you can see above, Abhayagiri Dagoba that looks about the same but has pillars in front and the whitewashed Ruwanwelisiya Dagoba with elephant statues around it. But that’s not all. There are smaller dagobas, temples and monuments, and a whole ruined city, much of which still lays hidden in the jungle. Anuradhapura also has the original bodhi tree that they say is the world’s oldest tree. It was brought to Sri Lanka as a cutting from the tree Buddha sat below. Anuradhapura is a treasure so UNESCO made it a World Heritage Site. The place has so strong connections to the country’s history that it is a pilgrimage site for all Sri Lankan Buddhists. So they all want to visit Anuradhapura. Click on the small photos to open them up in a slideshow. This monkey and all his monkey friends know it. They took and ate the flowers, all of them. Since people left, monkeys have been living in the lost cities – and there are a lot of them. The other red brick stupa of Anuradhapura is the Abhayagiri Dagoba. This stupa is huge too and its top is not broken like in the dagoba we saw before. And this dagoba has a gate of stone pillars. A negative surprise was that we could not get inside any dagobas since only monks are allowed in. I’d like to see what these huge domes have inside and what a construction is like that stands there for thousands of years without any damage. Anuradhapurans also built a rock temple, Isurumuniya Monastery, with a huge reclining Buddha that doesn’t fit in any photos. 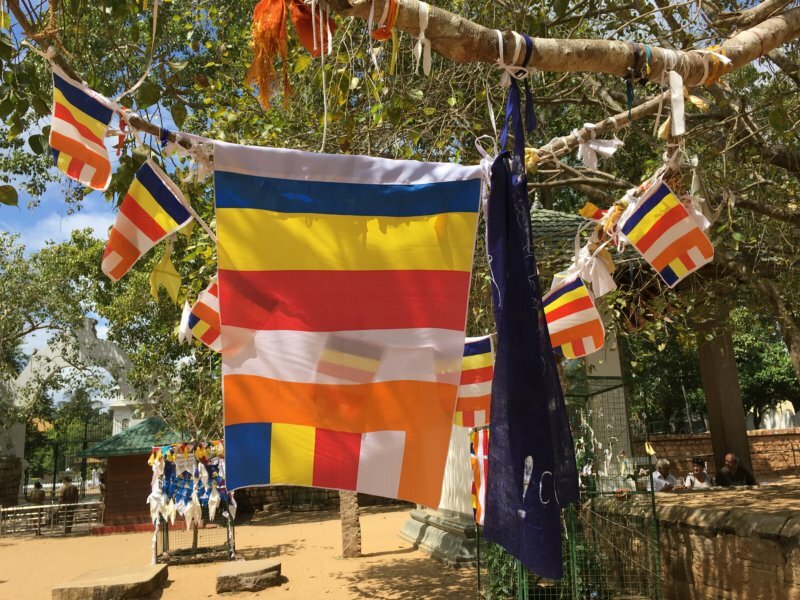 All Buddhist temples and stupas in Sri Lanka have a lot of flags around. They are Buddhist prayer flags. This is the most visited Anuradhapura stupa. Monks in their orange robes and pilgrims, school classes and other visitors in white flock to this gorgeous stupa surrounded by rows of black stone elephants on all four sides. The white surface needs more maintenance than the red brick ones. Volunteers are climbing bamboo ladders to wash and paint the dome. Would volunteering in temple washing be your thing…? One more thing I need to show on Anuradhapura ruins are these two pools, the Twin ponds. They used to be the ritual baths and still have steps to the water on each side. The ruins are spread out on a large area in the jungle so you need a car or a bike (that you can rent). The entrance fee for tourists is USD 25 (Feb 2018). To plan your visit and look at the ruins in a satellite view: zoom in one of my maps in this post. The area has a lot of beautiful lakes. Yet they are not normal lakes that they look like, they are water tanks. The kings were clever. Since they needed water to grow rice they built artificial water tanks to store water from monsoon rains. Still today rice fields dot the countryside. The area is known as the rice bowl of Sri Lanka. The biggest tank is Lake Nuwarawewa built 20 BC and the others are Tissa Wewa and Basawakkulama. Where we stayed: right on the lakeside, just the wall and the road separating us from the lake. The hotel’s name was Lakeside at Nuwarawewa. 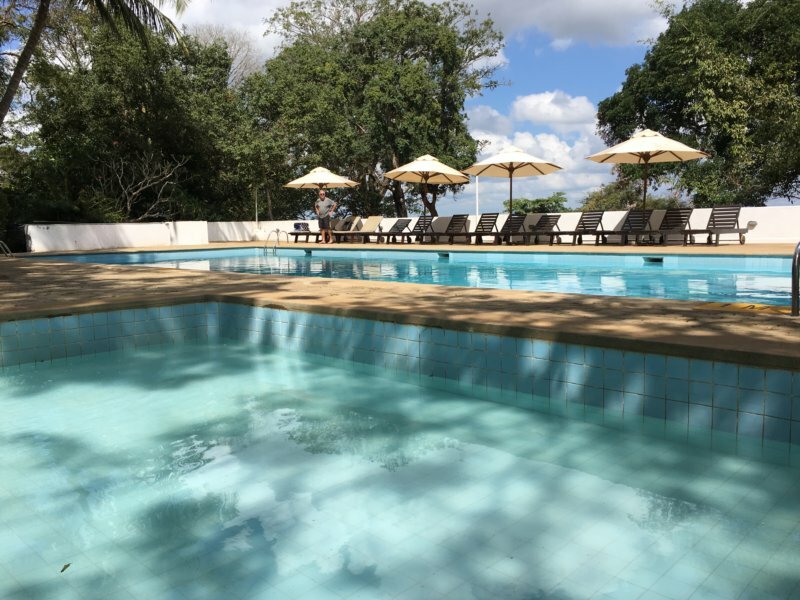 The hotel also had a shady swimming-pool that we used a lot since our days in Anuradhapura were really hot and humid. We half-slept in sunbeds and watched monkeys return from the village to the lake. Every day they returned the same time through our hotel garden and they jumped from tree to tree. The hotel was very good in surprising us. First there was a fruit basket, then a flower heart on the bed, next time flowers in the bathroom and they also used my IPhone cable in a creative way. And what about Anuradhapura town itself? 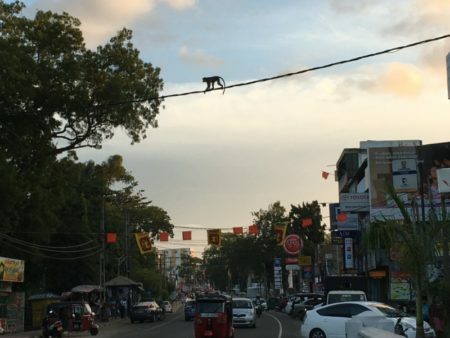 It’s a busy, noisy Sri Lankan town. Close to the hotel and small enough to stroll through which we did both nights. And there was a busy bus station with painted Sri Lanka buses. But we didn’t come here for the buses. We came for Sri Lanka’s ancient cities and the next city was Polonnaruwa. This is where the kings settled after they had to escape from Anuradhapura. That happened in the 11th century. Polonnaruwa at that time was a partly Indian, partly Buddhist local town and the kings changed it to the island’s capital. And they ruled the island from Polonnaruwa for the next 200 years. There were three kings in all and the 12th century became Polonnaruwa’s golden age. Here, too, the kings built huge lakes to store water. These 1200 years old lakes still supply rice fields with water like they did in ancient times. Polonnaruwa ancient city was located on a lake shore and strong stone walls were protecting the land side. Yet the ancient city fell into chaos round 1300 and disappeared from the map until it was rediscovered in the 20th century, so well preserved under all plants. These photos help you see how deep in the jungle it all was. After you clean the stones from plants the jungle takes over again at no time at all. The baths are close to Mahaveli River that is Sri Lanka’s biggest river. It flows from Adam’s Peak in the Hill Country to Trincomalee on the East Coast. This is the Royal Palace that was seven storeys high and surrounded by thick stone walls. 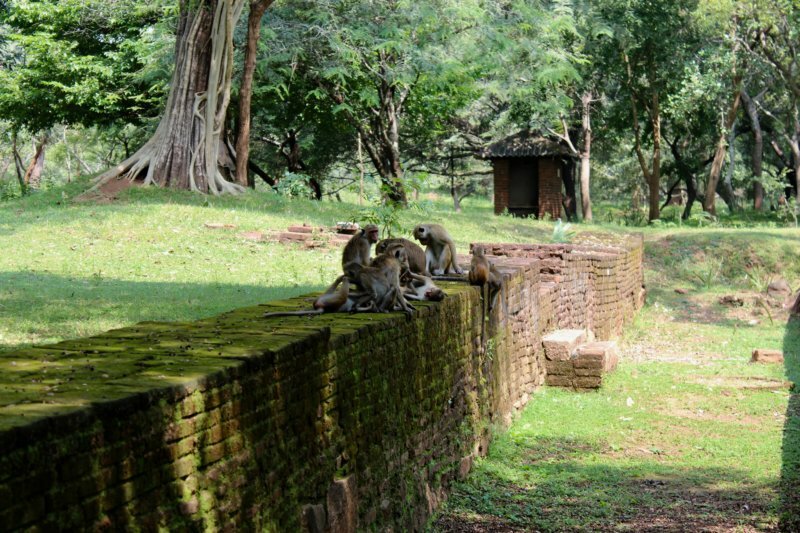 You can still see the walls but there’s no need for them anymore since nobody is attacking – except the monkeys that use the palace as their home. They will definitely attack you if you carry any food with you. Then there is the Quadrangle with this temple, the Vatadage Temple. It has Buddha statues inside and stone stairs with a moonstone with elephant decorations below the steps. The Quadrangle stands on a terrace and has brick walls on all sides. More photos of the Quadrangle: a monument, feet of a statue and Vatadage moonstone elephants. What I really liked was this Indian style Shiva Devale temple. It has tamil writing on walls and a small shrine inside. Now we have seen Polonnaruwa, the second ancient city and the next destination will be Sigiriya some 60 km west. To visit Polonnaruwa you need to pay an entrance fee, USD 25 (Feb 2018). The ruins are spread out on a large area so to see them you will need a car or a bike. You can plan your visit and examine the area in a satellite view by zooming in one of my maps in this article. This is the famous Sigiriya Rock, the third UNESCO World Heritage Site in Central Sri Lanka. The rock is really massive and rises 200 m above the plains. You can see it from almost everywhere in the region. 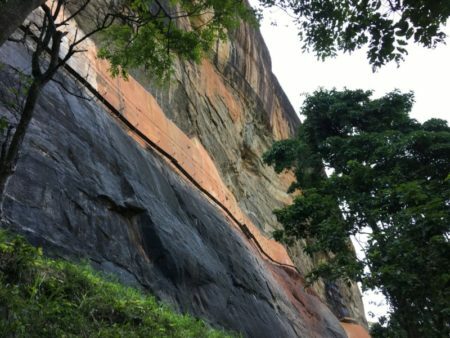 Sigiriya Rock has an unusual history. An Anuradhapura prince Kaspaya built his castle on the rock top after killing his father – to get the throne. He was fighting with his brother and needed a safe place to stay at. So Kaspaya built a fortress on the top and water gardens below and ruled the country from the rock top until he died by killing himself. As you can guess the jungle took over his palace too, and Sigiriya ruins were first discovered in the 20th century. Here we are on the way to the rock, taking photos of the beautiful water gardens. To get to the area you pay an entrance fee, USD 30 (Feb 2018). Unlike in Anuradhapura and Polonnaruwa the Sigiriya area is small enough to explore on foot. You can climb to the rock top. There are steep stairs but the climb is demanding in the heat so take good shoes, a water bottle and towels to dry your sweat. It’s a long climb and very popular. Our driver said we have to get there at 8 a.m. to avoid the crowds but many people had thought the same. So we climbed in a queue. These are the stairs on from a half-way stop, the Lion Platform. You can see the lion feet carved in stone in my photo. Here you can already see the top. The first part of the climb was much steeper, longer and all the way in shade. On the way up we passed the Mirror Wall. The name comes from the brilliant shine the wall is said to have but we could only see the graffiti of former visitors. The sun didn’t shine on the wall. In addition there are the famous wall paintings Sigiriya Frescoes. They were gorgeous but as you are not allowed to take photos on them I have no way showing the frescoes to you. Sweaty but happy, on the top! Finally, on the top of the Asian Ayers Rock! Sweaty but happy! We walked in clifftop castle rooms and halls for a long while before taking the same stairs down. Nothing wrong with these 360 degree views! Sigiriya is very well located to all Sri Lanka’s ancient cities and for that reason a perfect base for touring the Cultural Triangle. If you choose to stay in Sigiriya you can visit all my attractions as day trips. What is nice too about Sigiriya is that the village is almost in the jungle – and that’s exactly what many travelers also come for, the jungle. 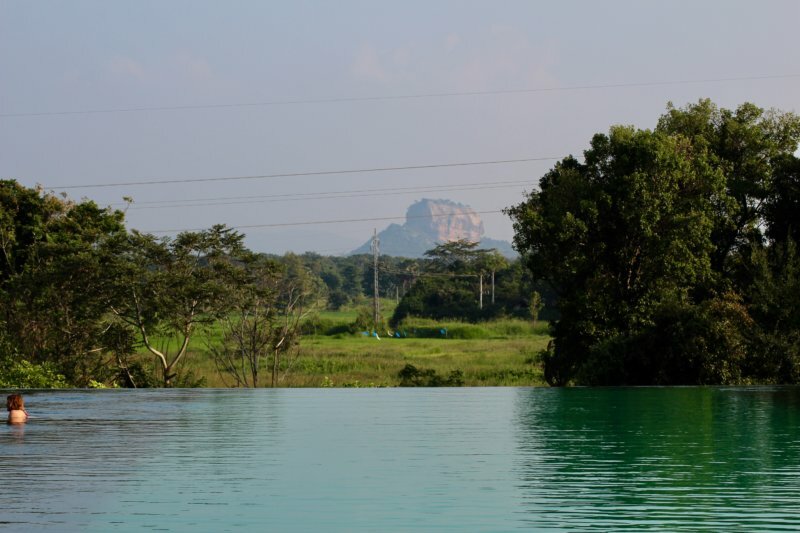 Or what do you say about this jungle lake with a view of Sigiriya Rock? So it’s not a lake, it’s the Aliya Resort pool. The pool is dark grey on sides and turquoise elsewhere, just what you expect real jungle lakes to be like. This kind of scenery just makes me stop, sit down and stare, in silence. Such a peace, so amazing nature sounds and birds, so humid and so many different strong green colors. We are almost on the equator and this is what the nature in that zone is like at its best. I need to take photos, and take more photos to get back to this amazing feeling afterwards. What about the hotel itself? It looks like an elephant, reaching out to drink water from a jungle lake. I can’t help thinking that way and maybe I’m right, Aliya in the Sri Lankan language Sinhalese means elephant. We took it easy between attractions and used the sun chairs. And I have to say Sri Lankan Lion beer tasted extra good after climbing the Sigiriya Rock! This elephant hotel was one more good choice from our travel agent, we couldn’t have found so good place to stay at ourselves. This is the Aliya Resort & Spa website. What about real aliyas, elephants, then, did we see them? Yes, we did! And a lot! Since we had hardly seen any elephants yet in Sri Lanka we took an elephant safari to Kaudulla National Park. Our travel agent had booked us a jeep at Habarana, a village where many operators offer safaris. Since national parks are no zoos we were first worried about if we would see any elephants. But that day Kaudulla had a huge number of elephants and we saw more than 300. Elephants need a lot of water and during the dry season they wander to waterholes. 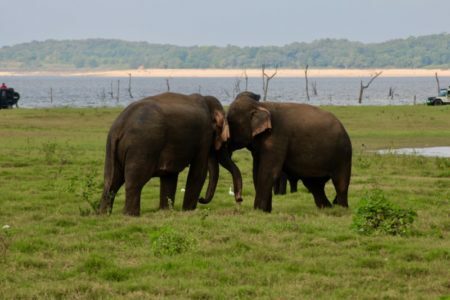 These elephants had just migrated to Kaudulla from Minneriya National Park and they were all on the Kaudulla lake shore. In fact it was mainly female elephants with their babies. The males prefer to stay outside the herd and we saw males mostly in the forest. This elephant is eating grass. They need to eat at least 150 kg grass a day. Sri Lanka originally had a huge elephant population but they have decreased in numbers. Today just a few thousand elephants live in the wild, most in national parks that there are more than twenty of in the country. Since elephants need to move a lot (they walk 40 km a day) they have built corridors between national parks so elephants can move around as they want. An egret, bird nest, peacock, eagle, buffaloes and a kingfisher. We have seen already three UNESCO Sites but this historic area has one more UNESCO World Heritage Site, the Dambulla Cave Temples. The Dambulla Cave Temples were carved in the rock in the 1st century BC when King Valagambahu was forced to leave Anuradhapura for a Tamil attack. The king stayed 14 years hiding in the caves before he got back his throne, returned to Anuradhapura and continued ruling the island. The king’s caves were rebuilt to five rock temples each of which contains an enormous number of Buddha statues: small, big, sitting, reclining and standing Buddhas, all painted in gold. The biggest Buddha is 14 m long and there are dagobas and statues of former kings as well. All walls inside the caves have rich decoration but the outer walls are all white. Cave Temples have an entrance fee that you pay at the car park. The temples are on a high hill so getting there is a bit like an effort. You have to climb steep stairs and I can say it’s hot. But once you are up you’ll get sensational views of the jungle country. 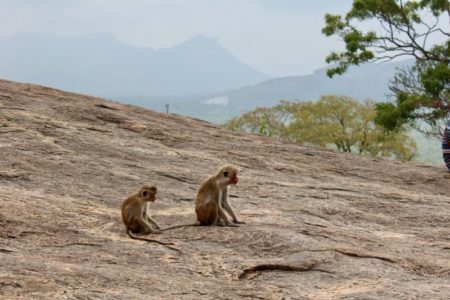 At Dambulla you will meet monkeys. There are many of them so watch your camera and belongings. Even when the monkeys look tired and bored they might not be that. We saw a lot of gold inside the cave temples but there’s one more place that shines even more than the caves. It’s the Golden Temple. 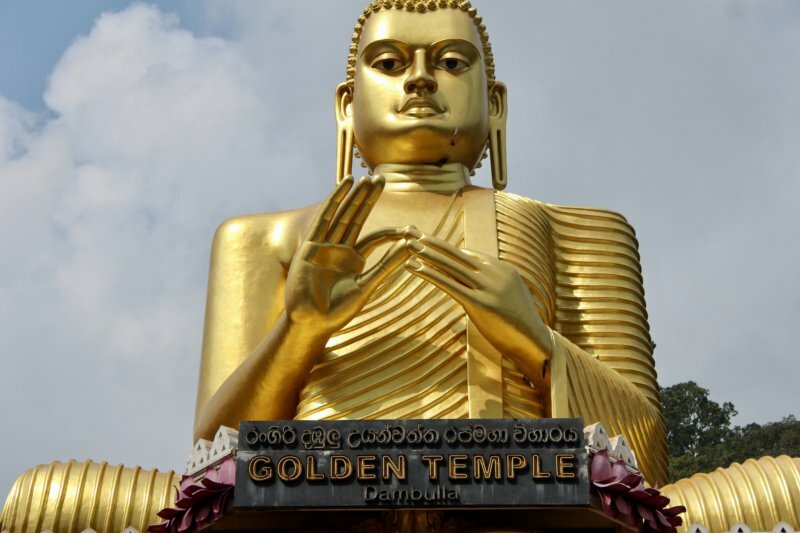 The lesser known Golden Temple is in Dambulla town and it is s a very unusual construction. The temple is topped by a giant 30 m golden Buddha, the balconies on its sides have white and pink decorations and the entrance is a dragon mouth. The mouth leads to a museum and the temple itself is upstairs. This was Central Sri Lanka and its main attractions: ruined capitals hidden in the jungle, temples and palaces both on rock tops and in caves, four world class UNESCO sights – and 300 elephants. We had great days in the Sri Lanka Cultural Triangle and I will return to the area and tell about one more ancient capital, Kandy. But first we will see the East Coast. Our next destination will be the beautiful, remote Sri Lankan East Coast. See you on the East Coast! When the kings escaped from Polonnaruwa they settled in Kandy. To learn about Kandy check our my post Historic Kandy: Temples, Lake and Rainforest Hills.